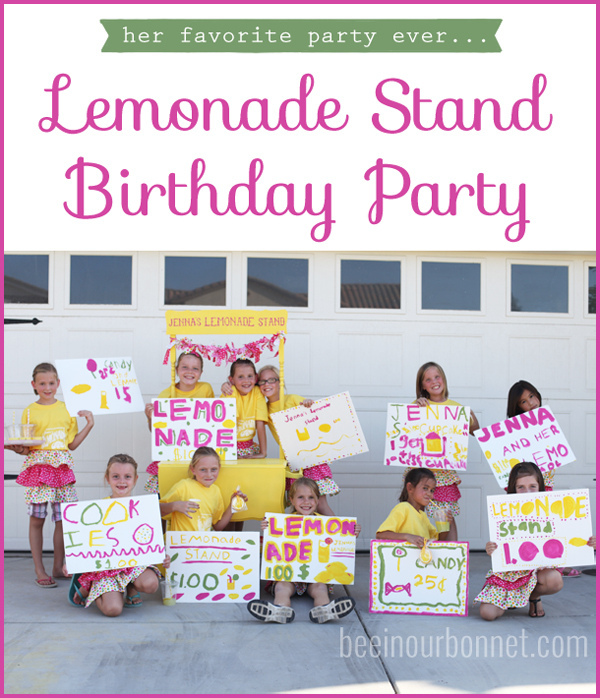 It has been over a year since my daughter’s Lemonade Stand birthday party, but she still talks about it all the time. 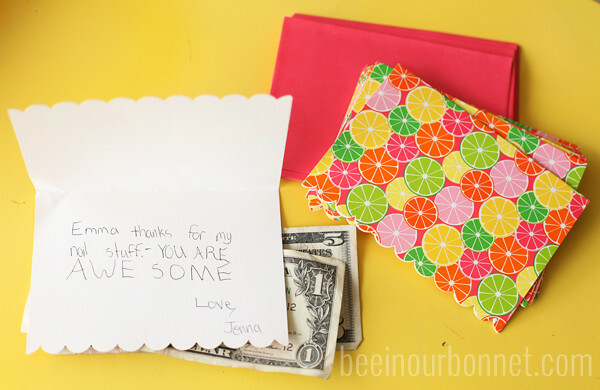 She has professed that it was her favorite party ever and I admit it has a special place in my heart too. Not so much for what we did at the party, but who was there. We miss her sweet little group of friends that were all able to come to this, along with her cousins who were able to drive up and be there. My daughter had this idea for a full 2 years before we did it. 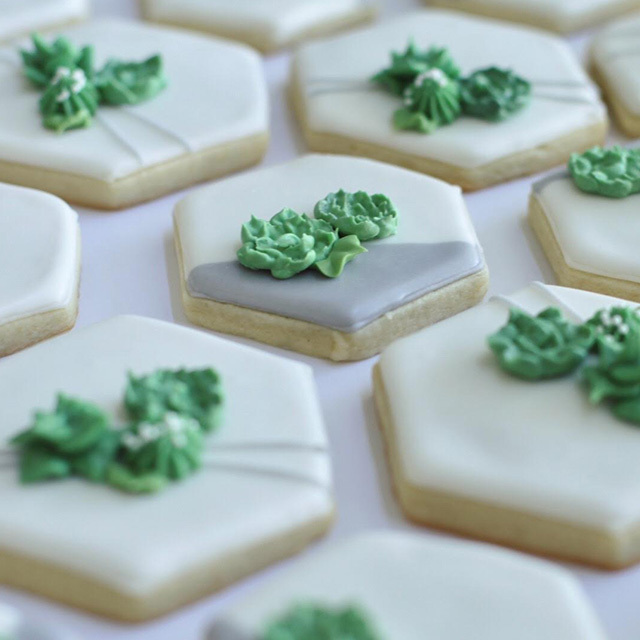 I loved the idea, but when party time rolled around, I didn’t get my act together, twice! This time I had a little inspiration. 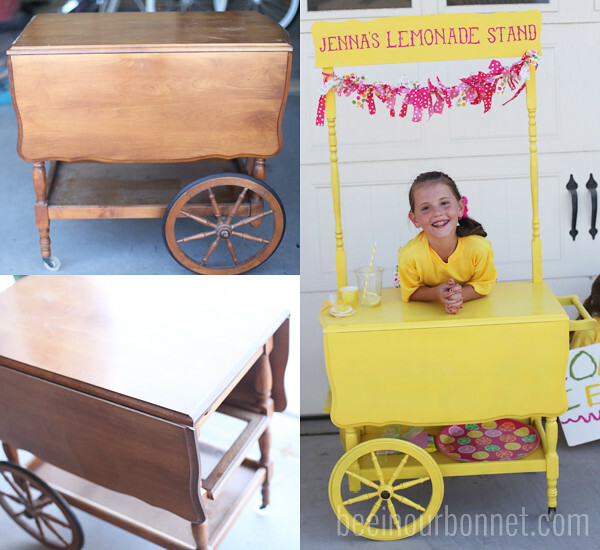 I found this old tea cart at my dad’s house and saw that I could easily turn it into a lemonade stand. I just sanded, added the top portion and then spray painted the whole thing yellow. 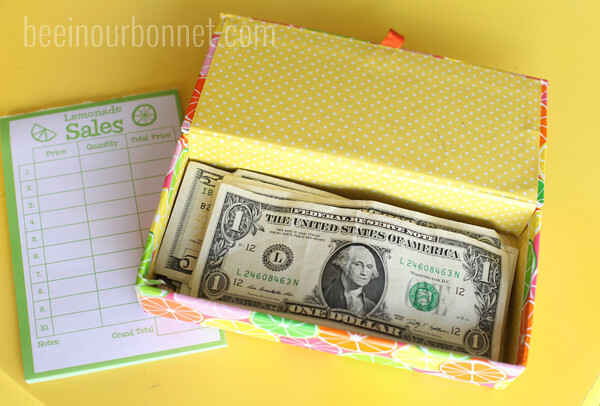 My daughter’s favorite part was the secret drawer where she could stash her cash! 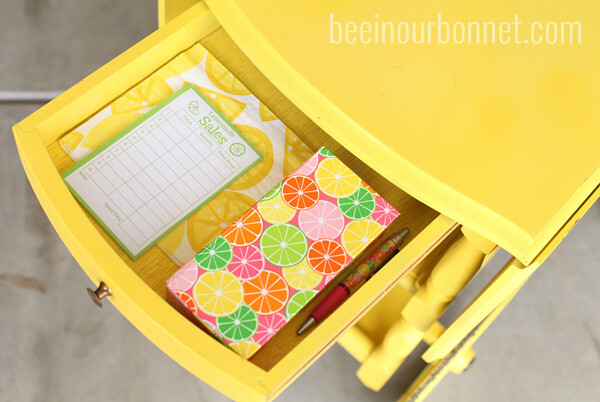 My favorite part was when Target had the cutest lemon stuff in their dollar aisle while I was planning this thing! I bought some digital elements online and made a simple invitation. I wanted to tell the parents in advance exactly what time we would be out selling the lemonade and told them personally that I’d love it if they’d come by. I didn’t want all this build up only to have no customers! 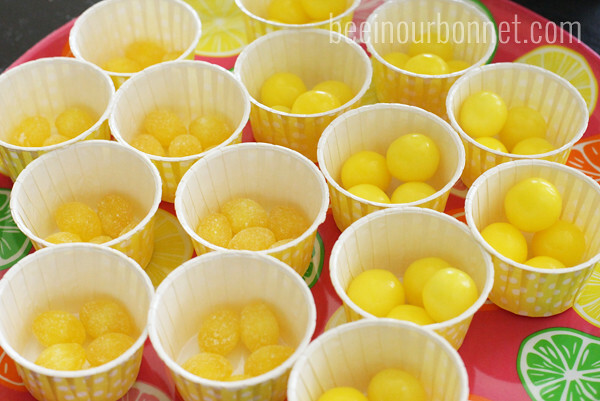 So with the invitations and a few conversations, I was sure we would sell at least a handful of lemonades. Another thing I just had to do was make them some uniforms. I need my child labor to look the part you know. (JUST KIDDING). I threw together some ruffle aprons by cutting a square of white fabric, sewing 3 layers of ruffles to it, then adding a waistband. They weren’t my best work, but they did the trick. I was also new to screen printing at the time and I printed some T-shirts too. When the girls first arrived we went straight to our marketing prep. 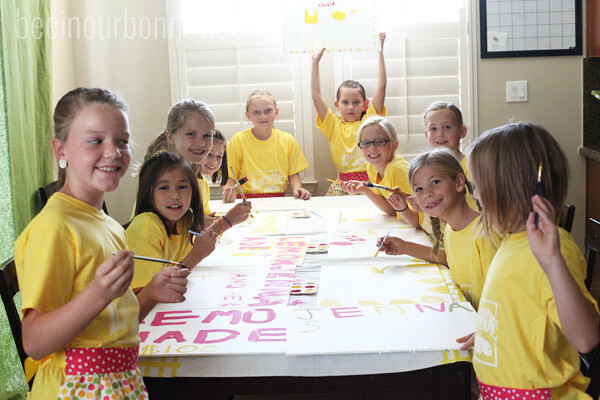 With some foam board from the dollar store and a few bottles of paint, they came up with the cutest signs! 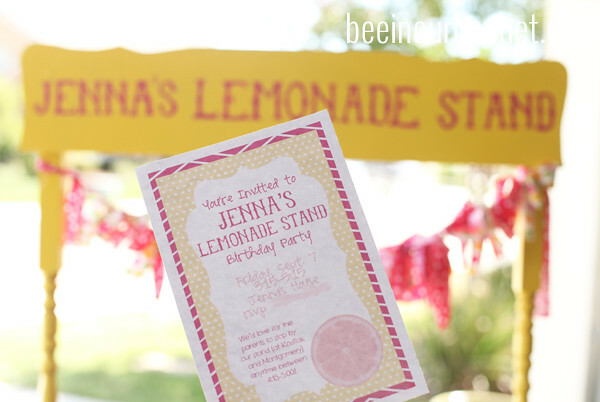 The next item on the party agenda was making the lemonade. I was so excited for each of them to squeeze some lemonade and I had some cooled sugar water ready to add to it. But when they finished their signs, it was almost time to be out selling, so I quickly made up some countrytime and called it good. If I were to do it again, I would have the party go 3 hours instead of my standard 2 hours. There was just too much fun to fit in! So we packed up the lemonade and the other goodies I had prepared for them to sell and went to the closest (somewhat) busy street. I was sure to leave some cupcakes home for when we got back. They doubled as product and birthday cake! 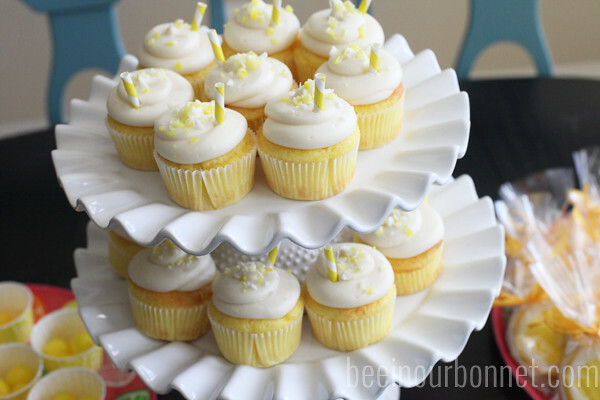 If you’d like the delicious recipe I used, check out this post about the lemonade cupcakes. 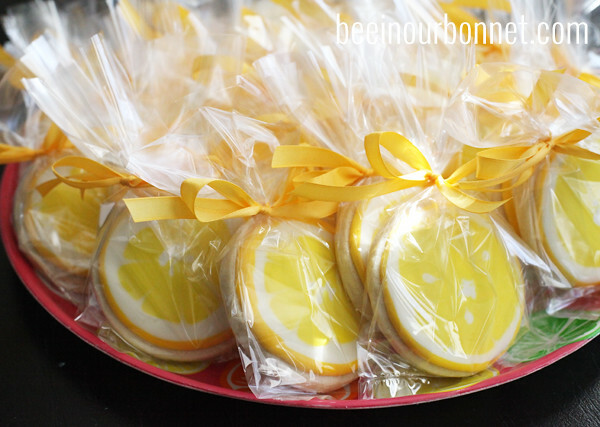 I also made some simple lemon slice cookies, and threw out some lemon candies for a low-budget menu item. With our stand, our product and all the girls they were ready to sell and beyond excited. And then… ChaChing!!! These girls brought home the bacon. I was seriously worried about getting enough traffic to make 10 dollars, but they raked in almost $86.00 in 45 minutes! (And lucky for them, they weren’t paying for their overhead 🙂 ) I should have predicted that the sheer cuteness of these eager girls, waving their signs, jumping up and down would make cars stop and even give tips! We were running out of product by about 40 minutes in. I guess I didn’t need to ask the parents to come but each girl was beyond delighted when their own parent approached their store front! Before the party, I had discussed a few options with my daughter on what we could do with the money. I told her she could keep it because she was the birthday girl and I was paying for what we sold, so I thought that was justifiable. (The kids expected it would be hers too). I also said she could split it with her friends because they were helping her advertise and sell. Lastly, I gave her the idea of giving it to charity. She made me proud as she waffled between the last 2 options. 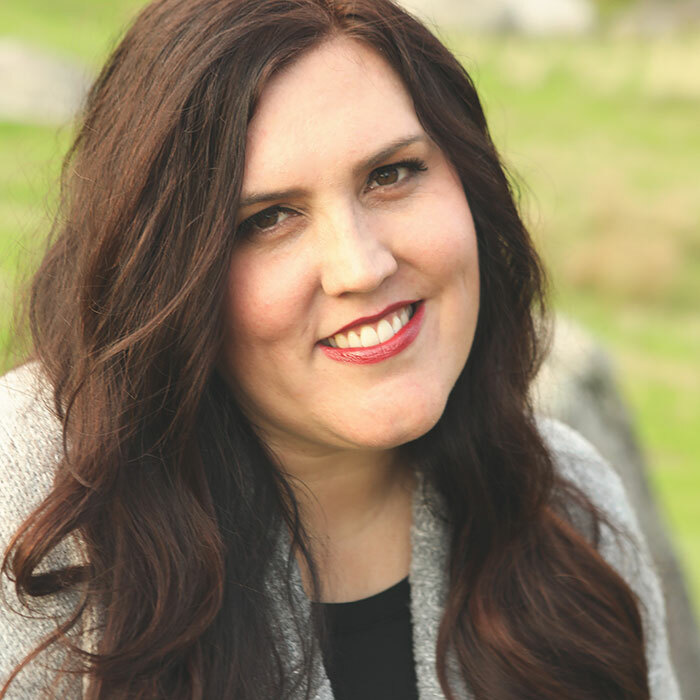 She finally decided she would split the money with her friends because she “wanted to pay her workers.” What a nice boss she was! I thought we would be splitting up 10, maybe 20 dollars, but since we raked it in, each girl got a nice little stash with their thank-you notes! 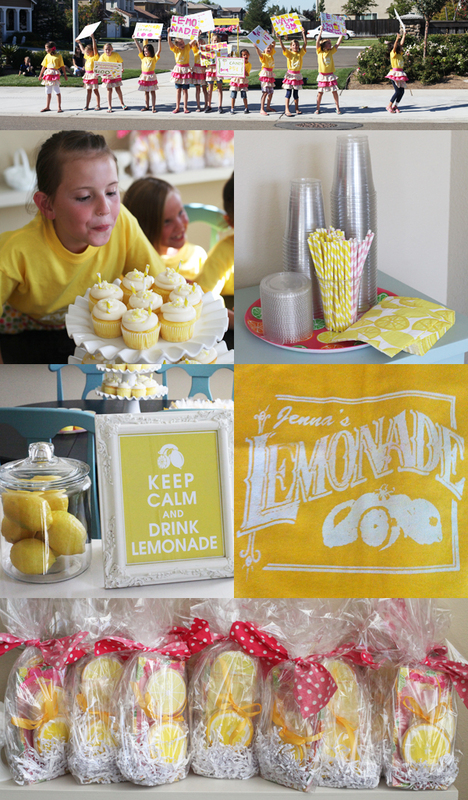 Here’s a few more pictures of the event…the paper products, the decor, a T-shirt close up and the goodie bags (filled with a cookie and some Target lemon-themed stuff). Aside from the memories of the adorable girls, I remember that it was some of MY WORST procrastinating ever! I started the stand 2 days before the party and did my last screen print 15 minutes before the party! Somehow I got it all done and it was for sure worth it! After the stand we had just a little bit of time for cupcakes and presents, then most of the kids begged to make more lemonade and go back out. 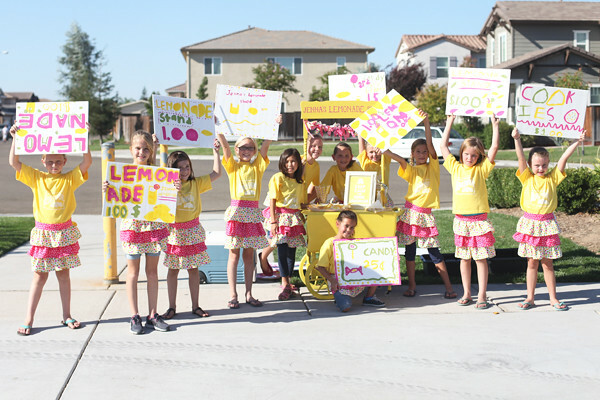 We ended up bringing this lemonade stand out several times this past summer and OF COURSE it moved with us! My kids can’t wait to sell in our new neighborhood! I think that 9 was the perfect age for this kind of party. They understand money enough to take orders, write receipts and be responsible with it. (They took turns being the cashier). They are also old enough to stay out of the street and be safe. However they were still young enough to be giddy at the thought of having their own little store and earning their own few dollars! I may be idealizing this party a little, but honestly, it was one of those snippets in time where I wished I could freeze my daughter’s childhood, treasure her friends, and bottle up the excitement they all shared. I only hope their memories of this event are as wonderful as mine are! I love everything about this party especially the heart warming feelings. The parties you have posted are the best. I am so glad you shared this one. Adorable! I loved this Kathryn. Hi Kathryn! I just LOVE this party you planned to your daughter!!! Is was in Yellow, my favorite colour in my chilhood! And what great ideas you had! You made me wish to be a little girl and to a part of that party!!!! Congratulations!